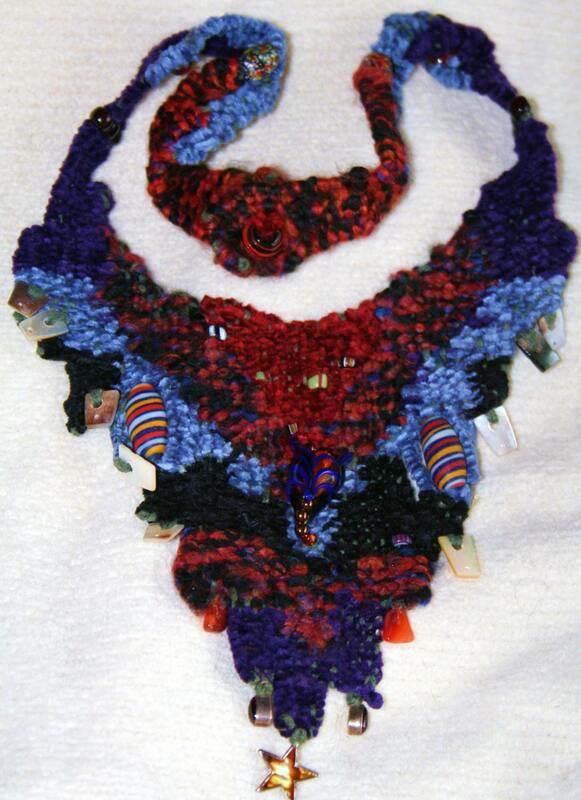 This is a woven fiber necklace that features small charms and beads woven into its fabric. I build the loom in a free style pattern with heavy pins and weave with a single needle. The neck opening is @ 9" long from the back of the neck and the woven section is @ 15" with neck straps that fasten with a button clasp. The feature bead is a lamp worked glass bead that is a fox face and has two African trade beads on either side. The bottom row of weaving has a bronze, silver back star bordered by two Bali silver and carnelian teardrops. The side dangles are mother of pearl and carnelian chips. It looks great on a turtleneck or cozy sweater.